Okay, this article won’t be exactly about Grace “versus” Faith; it will be more like Grace “and” Faith, as they are intertwined. It is my attempt to connect where we were as children in our beliefs, and our potential to move beyond the early instruction into the flow of Grace. You see, we were usually taught by our parents to have Faith in God during our childhood years when we were most impressionable. As children we learned that there is someone doing things that we could not comprehend, and that we should have Faith in that greater power. In line with this, we were also taught to do good and to be compassionate to others in order to serve this higher being. I’ll use my own childhood as an example. As a child, the doctrines of the Roman Catholic Church were taught to me by my parents and even though I have little understanding of the meaning, I knew some of those doctrines were important. The Ten Commandments directed my behavior, and the idea of sin and its consequences set the boundaries of what I chose to do. These Christian beliefs actually aided me in discerning right from wrong. Then as a young woman I realized my thoughts and behaviors were not either right or wrong, but had degrees of rightness and wrongness. Recognizing my connection to the whole and having Faith that I was part of the Divine design lifted me into the organizational flow of Grace. My choices were supported by my Faith and were mostly for the greater good. As a child or young adult, adhering to a particular path of Faith and doctrine is a healthy way to develop early spirituality. Expanding that Faith and doctrine, we can come to live within the higher organizational order I call Grace. Our introduction to Faith can actually be seen as a stepping stone for us to accept Grace into our lives. 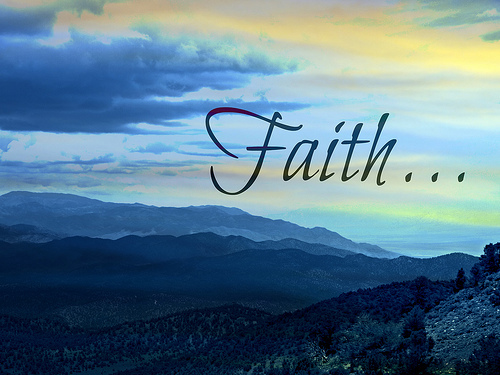 Let us take a look at Faith. Faith is defined as confidence or trust in a being, object, living organism, deity, view, or in the doctrines or teachings of a religion. Faith allows us to experience the fullness of life including joy, grief, suffering, peace and a multitude of qualities without exclusively identifying only with one or a few. We recognize our experiences are part of the whole of life and it is to our benefit not to identify with or to resist any particular quality. Faith is very important in the core beliefs of every religion in the world, and each religion teaches its followers to have Faith in its deity. In Christian doctrines, an expression of Grace and Faith are entangled as shown in this verse in the bible, “For by grace are ye saved through Faith (Ephesians 2:8).” For Christians, it is not possible to define Grace without at the same time referring to Faith, because both Grace and faith are said to be gifts from God. Recognizing Grace often begins with Faith. Grace and Faith are linked, and Faith helps us accept the freedom offered by the gift of Grace. Without Faith, people could reject this wonderful gift of the Creator-of-all and as a result they could fail to experience the expressions and results of living within the flow of Grace. To know of the existence of Grace early in our lives is such a gift and Faith helps make this possible.